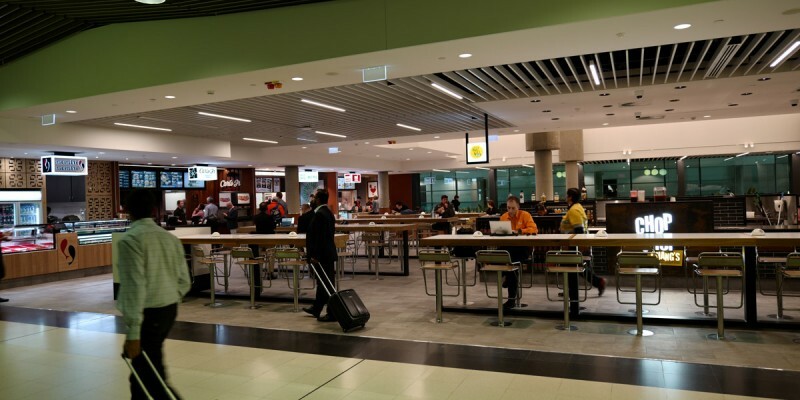 Durable Big River Engineered timber was pivotal to the retail upgrade of the Brisbane Airport Domestic Terminal Southern Concourse. As Queensland’s capital city and a popular holiday destination for both interstate and international travellers, Brisbane enjoys frequent visitors to its sunny shores. 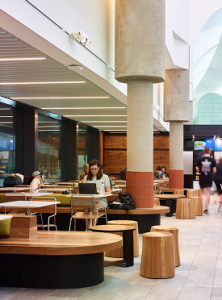 With the increase of passenger numbers passing through the Brisbane Domestic Airport, an upgrade of the Southern Concourse terminal by award-winning architecture firm, ARKHFIELD allows the airport to lay out a new, enticing and user-friendly welcome mat for the cosmopolitan city. 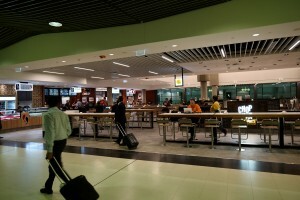 With a master plan to create a stylish and efficient retail upgrade for the southern concourse, including food court, premium inline food and beverage tenancies, and a small kiosk-like pop up retail that coexists with the airport’s operational requirements, the retail precinct design needed to be flexible to allow for continual upgrading through to 2025. 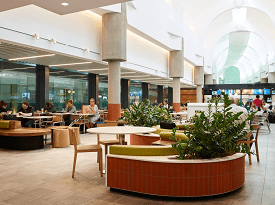 “The brief was to create a uniquely Queensland space that would feel comfortable and hospitable for travellers to use as a dwell space,” says Angela Layton, Practice Director and Interior Designer from ARKHFIELD. Originally completed in 1988 in time for the World Expo held in Brisbane, the airport received multiple architecture awards due to the colonnaded atrium under a skylight which stretched the length of the building, providing natural light throughout the entire space. Angela describes this connection to light as a major source of inspiration for the new design, “we wanted people to connect to Brisbane through the quality of light that is here – filtering and playing with the patterns and shadows to experience the time of day or season,” she explains. Another important design consideration was to honour the materials and craftsmanship of South East Queensland by using local materials and furniture makers to create a domestically scaled space. Along with the eye-catching Big River timber products, the custom-made furniture and mezzanine windows also help to enliven the space, coming together to showcase the sunny, vibrant and welcoming nature of Queensland and its friendly people. Big River Group manufactures and distributes timber and steel formwork products, timber flooring, structural plywood and related timber products and distributes a broad range of other building products, primarily to the commercial and residential, non?residential and infrastructure construction market segments. The Company has a network of 10 sales and distribution centres across Australia and sources its products from both its own manufacturing facilities and also many Australian and international manufacturers of building products. 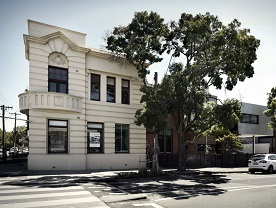 The Company owns and operates manufacturing facilities at Grafton and Wagga Wagga in NSW. 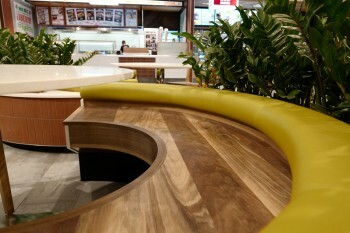 Armourpanel is Australia’s strongest decorative plywood – designed, tested and approved to tolerate extremes of heat and humidity and to resist shrinkage. Its tolerance of changes in ambient temperature and its toughness make it ideal as flooring, ceiling or wall linings in hardwearing areas. Every panel is made from layers of Australian eucalypt hardwood veneers bonded together to form a strong, solid, stable panel. Available as a 2400 x 1200 sheet or optional 1800 x 1200, no two sheets are alike meaning no pattern repeats – every sheet is individual and natural. Big River’s engineered flooring has established a reputation for being ‘Australia’s most stable floor,’ and is the only engineered flooring still manufactured in Australia today. 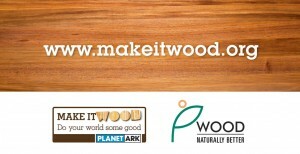 Beneath a thick top layer of Australian hardwood is an engineered eucalyptus plywood core. The hardwood eucalyptus core means that optimum stability is guaranteed between the floorboards with reduced risk of bending and cupping.